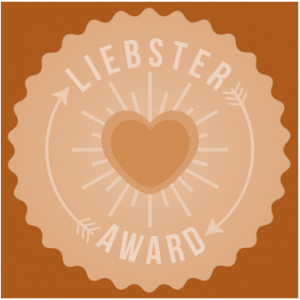 Sunday is a day off from the A to Z Challenge, but it's also the perfect day to fit in a new challenge: the one that comes with the Liebster award. Thank you to Kathleen Doyle at Writing, Reading and Life for nominating me. So thank you Kathleen for passing this fun award on to me. Everyone should pop over to her blog to learn a little bit more about her. It's amazing that with just a few short questions I already learned that I'd like her to be my new BFF. 1.I wrote (and illustrated) my first book in forth grade. It was about a girl in the forth grade who liked a boy in the forth grade (who looked an awful lot like Wes Brewer, but obviously wasn't because this boy was in a wheel chair. So, you know, no connection there). 2.I have a crazy obsession with moving to a farm. I want to be able to look out my window and see trees and rolling hills (and lambs, and goats, and horses, and ducks, and chickens... you get the idea). 3.When I was little I REALLY wanted to change my name, either to Alice or Liz, but now I love my name. 4.I can't play an instrument or really keep a tune, but I still dream of being a rock star. 5.I'd really like to write a movie script some day, but I want someone to cowrite it with me. Any offers? 6.For the past few years I've had terrible anxiety and hypochondria, so I'm often up at odd hours in the middle of the night, unable to sleep. 8.I used to have a reoccurring dream that I was in a dance performance, but didn't know any of the steps. I always had to improvise and this normally meant that I ended up doing a bazillion pirouettes in a row (even though in real life I could hardly do three). 9.Sometimes at dinner my kids make me laugh so hard that I'm pretty sure I'm going to inhale my food down my wind pipe and die. Don't be surprised if you read this in my obituary some day. 10. My favorite snack (besides candy) is cherry tomatoes sprinkled with lemon pepper. 11. I'd like to be a bird, but I'm kind of afraid of heights. Wow. That was kind of fun. I guess I like to talk about myself. Now to answer the questions from Kathleen. 1.Of the Three Stooges, which one are you most like: Larry, Curly, or Moe? I'm embarrassed to admit it, but I've never really seen the Three Stooges, but since I have a daughter that we call Mo, I'm going to go with him. 2.If you could take the place of any character in any book, who would it be and why? Hmmm... should I pick a human or an animal? Some of my favorite books have rabbits and mice for protagonists. But even though I've always wanted to snuggle up in a burrow in WATERSHIP DOWN, I think I'm going to have to go with Celia from THE NIGHT CIRCUS because I'd really love to be able to walk through Le Cirque des Reves in real life. 3.Mac or PC? Macbook air and I LOVE it!!!! 6.If your life was a movie, who would you want to play your nemesis? (HA! Tricked you on that one!) That's hard because I don't really have a nemesis in real life. I'll pick Stephen Colbert, just because it would be hillarious. 8.By some strange accident of fate, I’ve been stranded in your home town. Can I stay at your place? Of course, if you don't mind barking dogs. 10. What was your favorite book as a child? TUCK EVERLASTING, WATERSHIP DOWN, and MRS. FRISBY AND THE RATS OF NIHM. 1.If you were an animal what would you be? 2.What is your favorite book of all time (or two, or three)? 4.If you could have any talent (that you don't already have) what would it be? 5.If you could invite three famous people (alive or dead) to dinner, who would you choose? 6.If you had a time machine, where would you go first? 7.If calories didn't count, what would you eat today? 8.What book do you wish you'd written? 9.What antagonist do you most relate to? 10. If you could relive any day of your life, what would it be? 11. If you could live anywhere in the world, where would you live? Thanks Kate. Fun questions! Hmm, I better start thinking of answers. Happy Sunday! I don't blame you. I was just happy that it fell on a Sunday. All this blogging is a bit overwhelming for lazy little me. Great! I don't think there's a time limit. Congrats, Kate! I'm often up in the middle of the night as well. It's too bad we're in different time zones. Thank you for the award Kate! If it's okay with you, I'll leave it here at your place, and then collect it after the A to Z Challenge when I'll have time to respond accordingly. Enjoy the rest of the challenge! Congrats on the Liebster Award! I enjoyed reading your 11 random things, your 11 answers, your blogger picks and your 11 questions. (I'm kinda glad I didn't have to do all that.) The thing I liked best was the books that you've read, your favs and your cover pic. I love artistic covers and wish more people would do them. I totally get wanting to live on a farm and a movie script... now that sounds like fun! Wow, you had a busy day off. I love reading interesting and random tid-bits about fellow bloggers. Congrats on the awards. I am a new follower...I am also a procrastinator and a daydreamer as well. Oh and I can't carry a tune.. Nice to meet you. Thanks for the award. This is my first time receiving it. Kate, thank you soooo much for picking ME! Yay, awards!! Maybe I can do mine next Sunday...of course that's if I ever catch up on the A-Z challenge. I tripped and fell down at mile marker "L"